Explore 12 active baby games for 9-12 month olds to help in their child development as they experience new movements and abilities with their growing bodies. By the time babies are almost a year old, most are able to sit, stand, and walk alone. They have much better use of their hands than they did just a few months ago, and they love exploring the world around them with all of their senses. These infant activities give them an opportunity to use the skills they've already developed and master some new ones. Kids grow so fast, and it won't be long until you'll be needing some toddler games and preschool activities! Using a sink, tub, bucket, or kid's swimming pool, show your baby how to scoop water with a ladle and pour it into a container. Try a variety of different types of scoops - strainer, cup, spoon, measuring cup, etc. 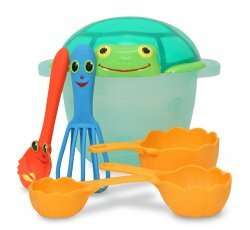 Place floating toys in the water and have baby try to fish toys out with one of the scoops. Take a bucket outside and have baby fill it with items she collects from nature - rocks, sticks, leaves, etc. Find a good place to sit down and dump the bucket out. Have baby describe it to you and tell you what it is. Put everything back in the bucket, go dump it all out, and find more treasures! Find some toys that have unique shapes and sizes. Wrap them up in foil, newspaper, wrapping paper, or tissue paper. Show baby one of the wrapped toys and let her guess what's inside. Let her unwrap it to see if she was right. Re-wrap them all and do it again. Let her wrap them up for you. Sit on the floor with baby and place several paper cups out in front of him. Partially fill each cup with a dry items - cereal, rice, crackers, or sand. Show him how to pour the material from one cup to another. Pour all of the cups into a large bowl and then have baby use a spoon to scoop the ingredients out of the bowl into each cup. Try doing it with water. Save boxes of all shapes and sizes, especially those with lids. Demonstrate how to take off lids and put them back on. Hide items inside each box for baby to find. Let baby drop items into boxes, cover them up, turn them over, shake them, and then dump them out. Find some big boxes for hiding larger items and for baby to crawl into. Find all kinds of containers – milk cartons, cereal boxes, egg cartons, cans, plastic bottles, shoe boxes, oatmeal boxes, etc. Have baby stack the containers to make a tower. Try building different towers with different shapes. 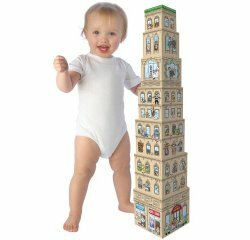 Let baby knock tower over when he's finished. Make a tunnel or a bridge with the containers and push cars, dolls, or stuffed animals through them. Show your baby how to draw simple shapes, lines, and zig zags. It may be necessary to hold baby's hand and guide his movement. As you draw, have your baby follow along inside your lines. 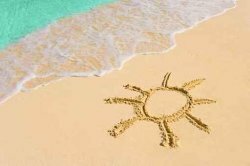 Drag a long stick behind you as you walk along the sand to see what kind of design you can each make. Hold your baby in front of a mirror. While looking in the mirror, touch a part of your baby's body and say what it is. Ask her to touch that same part. Repeat with all different body parts. While you're both looking in the mirror, see if your baby can touch different parts of your body as you name them. Place fun objects and toys in front of mirror and identify them. Perform a silly action and ask her to repeat it. This is a good game to play when your baby is first leaning how to walk. Scatter some small toys or objects on the floor. Hold your baby's hand as he walks. When he comes to the toys, he has to lift his foot and step over each one. 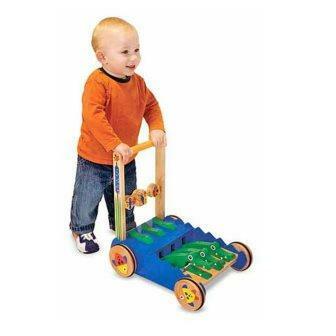 If he is able to step over small toys, introduce larger objects for him to step over. If the objects are too big to go over, teach him about going around or under. Babies need a lot of practice balancing as they learn how to walk. Pushing against a large moving object helps to improve their balance. Have baby push a stroller, a chair with rollers, a large exercise ball, a big box, or any other large object you find. 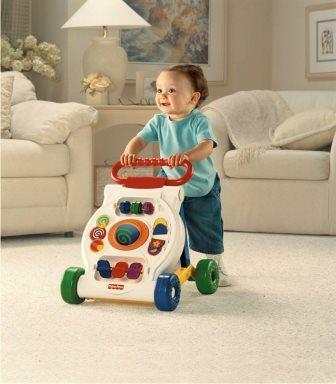 Scatter objects around the room that your baby can move over, under, around, and through. Tell your baby to come get you while you travel around the obstacles. This is a great game for beginning walkers. Make sure to include objects like pieces of furniture that the baby can hold on to as she tries to walk to catch you. Line up hula hoops perpendicular to the floor like a tunnel so baby can crawl through them. Lay hoops flat on the ground and have baby crawl in and out. While baby sits, stands, or lies down, you can raise and lower hoop over his head and body. Find different ways to sit and stand inside the hoop. Try sitting and standing inside the hoop together. Roll the hoop and have baby chase it. Spin the hoop like a top. 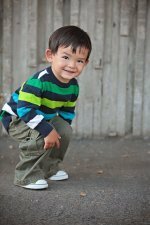 Hold a hoop up at different heights and angles and let baby crawl, walk, or climb through. Toss objects into hoops that are laying flat on the ground or through them if they are propped up. Put stuffed animals or other toys inside hoops. Make sure your baby has the postural control to do these games. Take your time with each activity. Don't rush. Provide plenty of praise when your baby is successful. Make sure baby is alert and awake. 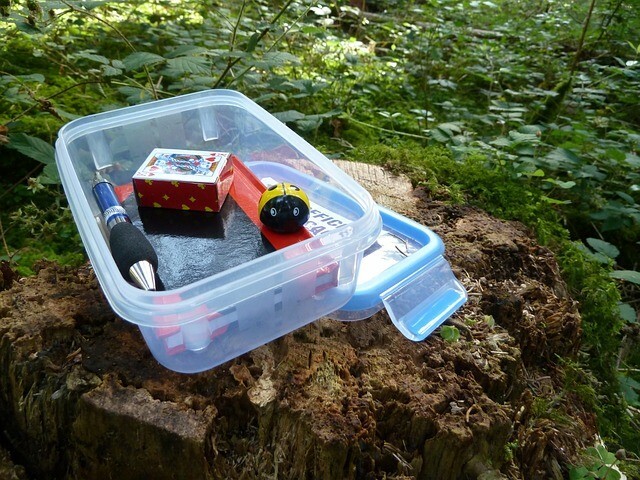 Use your imagination to modify games with different objects. Include more people in the activities. Check out our complete list of free kids games!